Roddran Grimes likes to reinvent herself about every 10 years. 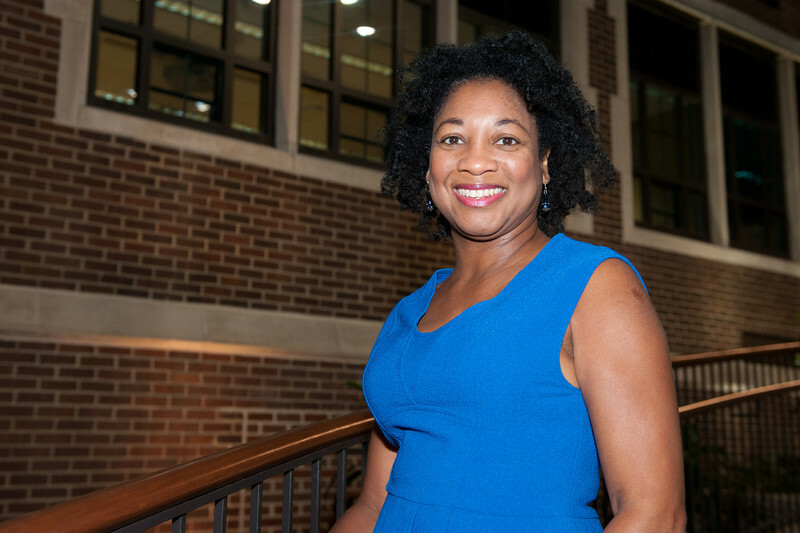 From working in the information technology field to incorporating that into the healthcare field to becoming a special education teacher to now becoming a professor, Grimes has been unafraid to remake her life. "I never want to live a stagnant life and I'm not afraid of change," she said. "Therefore, when there is something that I want to do or have, I am willing to take calculated risks in order to obtain it. I enjoy being the butterfly and going through a metamorphosis once the desire sets in to try something new." Twice, she has selected Indiana State University to help her on that journey of change. "I bleed ISU blue," she said. "This is my school." 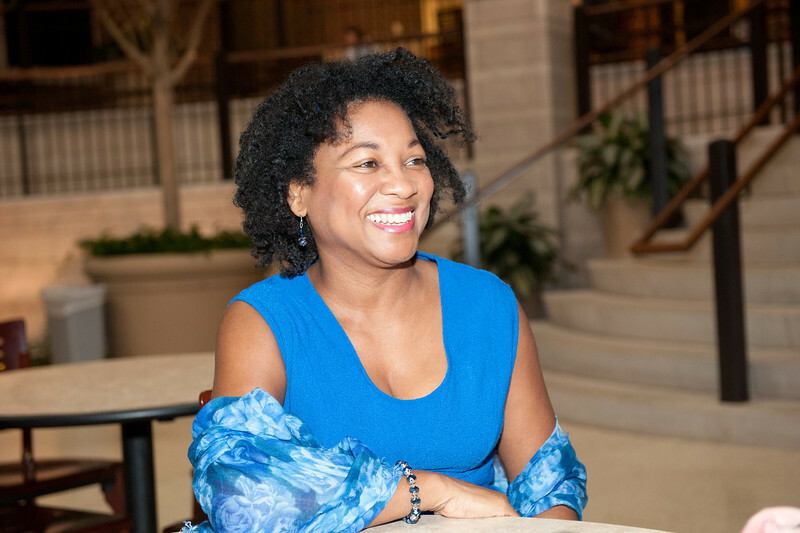 Grimes first encountered Indiana State as a high school student when she traveled from her hometown of Gary, Ind., to Terre Haute to attend the Summer Honors program at ISU. When it came time for her choose a university, she recalled how much she enjoyed her summer and enrolled. 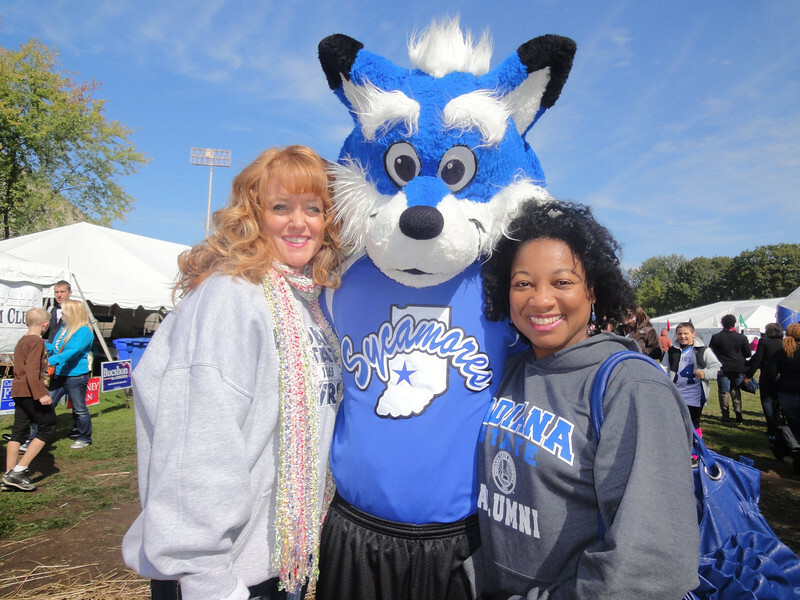 "It was the best time of my life," she said of her undergraduate years at Indiana State. For four years, she lived in Hines Hall room 313 where she had to ask the switchboard operator for an outside line. 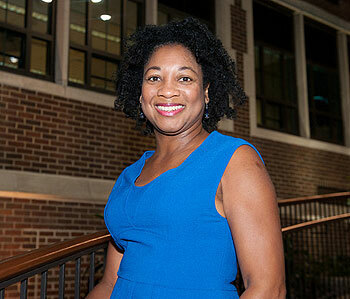 After graduating with a degree in safety management in 1982, she moved to Atlanta and transformations continued. About eight years ago, she decided to leave healthcare information technology and become a teacher. "I felt a calling to be a teacher," she said. "This is the journey I was meant to follow. It has been good to have corporate experience to bring to my teaching career." When she looked at the critical need fields in education, she knew she had the patience to become a special education teacher in junior high. "I like the fact that all children are unique, all children are special," she said. While she has experience teaching a variety of subjects, Grimes especially liked finding ways to help students engage in reading. "Everything is geared toward reading," she said pointing out that students need to be able to read instructions on tests. She worked with them one-on-one, played games to increase their reading levels and found subjects to interest a child in reading. "I love it when there's that light bulb moment," she said. When Grimes decided to pursue her doctorate in education, she first investigated schools in Georgia. Since the mid 1990s, Grimes had been involved with ISU's Alumni Association, including now serving on the association's board of directors, and she felt once again drawn toward her alma mater. "Something said to me to investigate Indiana State," she said. She spoke to Susan Kiger, chair of curriculum, instruction and media technology, who encouraged her to apply for the Ph.D. program, though it's not set up as a distance program. "Roddran made the distance factor work by planning her course work carefully and making the ‘trek' to campus during her summer hiatus from teaching in middle school in Atlanta, Georgia," Kiger said. On those summer sojourns, Grimes again found herself living in a dorm and attending classes at Indiana State. "It was a nice sense of déjà vu. I love ISU and walking around the campus. It was a great educational experience," she said. She also attended classes through Skype and other programs while living in Atlanta. "I'd be the talking head," she said. Through that she found a friend. Melanie Beaver, who was also working on her doctorate, saw Grimes attending class via a laptop. "I don't feel successful unless I'm building relationships with people so I figured she needed to feel connected to us," said Beaver, who also teaches junior high. Though Beaver said she felt intimidated using Skype, when the class broke into pairs to discuss that week's reading, Beaver "scooped her up." Beaver began taking Grimes to class via her laptop. One of the times, Beaver even dropped off her laptop, Skyped her in to the class and left another classmate to "Roddran-sit" while she attended another function. She picked up her laptop after class and found Grimes had taken careful notes and emailed them to her. "If you think about it, I refused to let her miss class, and she refused to let me miss out on what was covered," Beaver said. "Our relationship was a blessing both ways." And that relationship has grown through the semesters. Now, when Grimes comes to visit Terre Haute, she stays at Beaver's house. "Roddran is a phenomenal person of integrity and class. She's well-read and heralds the loudest laughter in the room," Beaver said. Relationships such as the one Grimes formed with Beaver and other women coalesced in a group Beaver dubbed the DocDivas. "I think that's what made our journey so successful," Grimes said. "You need a partner." Beaver said the four women made, and still make, conscious efforts to support each other through cards in the mail, encouraging texts and reminder emails. "There were times when we'd cry, laugh ridiculously, take walks together around the Bayh College of Education and, of course, overeat chocolate," Beaver said about their time in the doctoral program. "Truly, the drama seems trivial now, but it is undeniably what helped us stay the course. We took our coursework seriously, but we refused to take ourselves seriously. 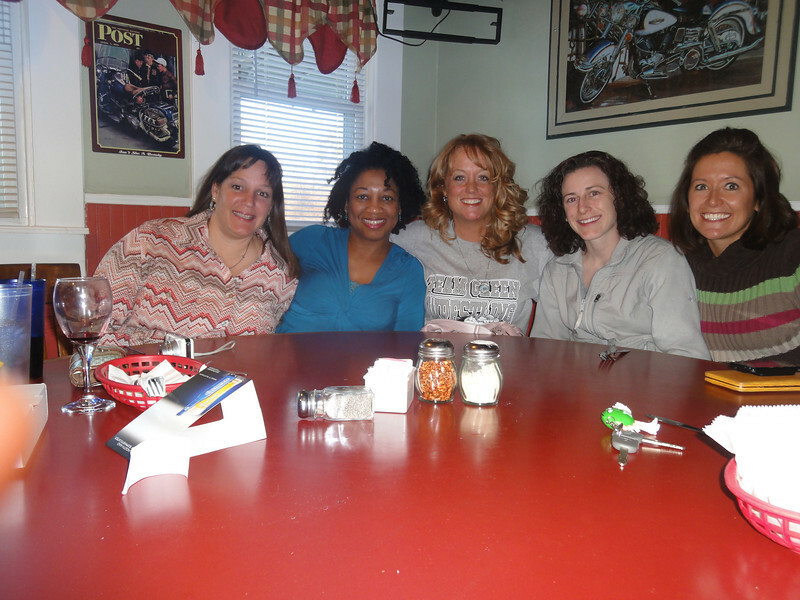 As adult women with full-time careers and families, we needed each other." Beaver and Grimes even defended their dissertations on the same day, Beaver successfully completing at 2 p.m. and Grimes at 4 p.m. In the acknowledgements section of Beaver's dissertation, she wrote, "Completing a dissertation is a lonely task. I was lucky to meet Atlanta-based Roddran Grimes along the way. I tethered myself to her via Skype, email and text and did not let go. She spoke my language every step of the way, and she is now my lifelong friend." Grimes said completing her doctorate at ISU was the best decision she could make. "Professors here care about you...they'll get you through," she said. "It was good for a working adult. I was able to maintain my lifestyle in Atlanta, my home, everything and work full time. With online classes, one can go to a traditional research institution and have the same robust education." With her doctorate in hand, Grimes decided to reinvent herself once more and in a new place. She is now an assistant professor in special education at Lewis-Clark State College in Lewiston, Idaho, which she described as a smaller version of ISU. "I feel such a peace when I walk on campus," she said. "It's nice living in a totally different part of the country. Life takes us to interesting places." Kiger said that while the program has intelligent, highly motivated professionals, that Grimes's empathy for others and dedication to their welfare distinguished her. "As she continues on in her new academic endeavors among the professorate, she will model and promote those qualities among developing teachers," she said. "Those qualities are a critical foundation for teachers as they promote the academic and social development of our youth." In the future, Grimes plans to continue transforming herself into the woman that she wants to be. "I have an adventurous personality type so when boredom or a need for change sets in, my mind starts working to determine a solution," she said. "The answer always comes to me and then I take action to bring what I want to fruition." For Roddran Grimes, life is about transforming herself into the woman that she wants to be.